The Jam would like to give you a chance to win two tickets to see Tyler Henry “The Hollywood Medium” at the Silver Creek Event Center at Four Winds Casino in New Buffalo, Michigan on Saturday, May 11, at 9 PM! Tyler Henry “The Hollywood Medium” - the star of E! Entertainment’s mega hit television show, Hollywood Medium with Tyler Henry - continues his Life Lessons tour across the county. At his live show “Life Lessons I’ve Learned from The Departed” audiences will be treated to Tyler discussing his unique gift and how it affects his everyday life with a multi-media video presentation PLUS live readings and audience Q&A. Don’t miss a special evening with Tyler Henry “The Hollywood Medium” at Four Winds Casino… Your Entertainment Escape. 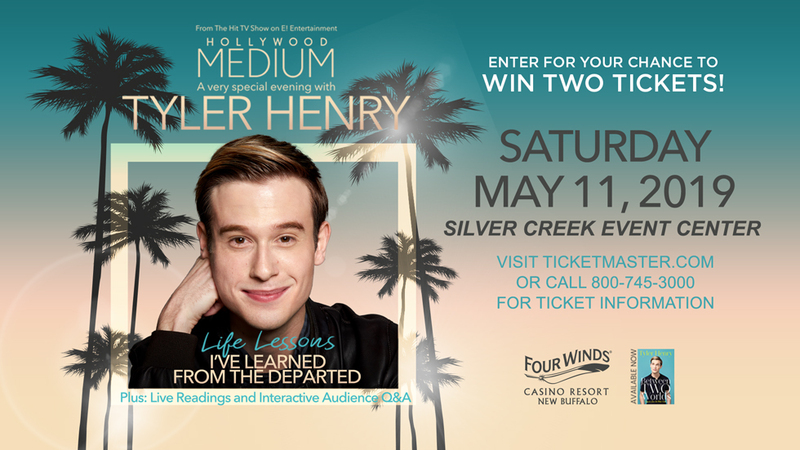 Now through Sunday, April 21, 2019, at 11:59 PM CDT, fill out the submission form to enter for your chance to win two tickets to see Tyler Henry “The Hollywood Medium” at the Silver Creek Event Center at Four Winds Casino in New Buffalo, Michigan on Saturday, May 11, 2019, at 9 PM EDT. Fifteen (15) winners will be randomly selected using a computer software winner selection tool from all eligible online entries. Sign up for the WCIU, The U Newsletter! ENTRY. A purchase is not required to enter or win two tickets to see Tyler Henry “The Hollywood Medium” at the Silver Creek Event Center at Four Winds Casino in New Buffalo, Michigan on Saturday, May 11, 2019, at 9 PM EDT. Sweepstakes begins Monday, April 8, 2019 at 12:00 AM CDT and ends Sunday, April 21, 2019, at 11:59 PM CDT unless extended by ‘WCIU, The U.’ To enter the Sweepstakes, viewers must do so at WCIU.com and complete an online form to register. Only one (1) entry per person, per email address, per 24 hour period will be accepted (12AM-11:59PM). Fifteen (15) winners will be randomly selected using a computer software winner selection tool from all eligible online entries. ELIGIBILITY. ‘The Jam & Tyler Henry “The Hollywood Medium”’ (Sweepstakes is open to all legal residents of Illinois and Indiana who live in the Chicagoland television viewing area (as defined by A.C. Nielsen) and are 21 years of age or older. Employees of ‘WCIU, The U’, The Four Winds Casino, and their advertising agencies, consultants, franchisees, suppliers, (collectively, “Sweepstakes Parties”) are not eligible to enter or win, nor are such employees’ family members. In addition, individuals who share a common household with an employee of a Sweepstakes Party or who are in any kind of domestic relationship or partnership with an employee of a Sweepstakes Party (e.g., boyfriends, girlfriends, fiancé, roommates) are not eligible to enter or win this Sweepstakes. Sponsor shall be the sole judge of what constitutes a domestic relationship or partnership in the event of a dispute. PRIZES. Fifteen (15) winners will be awarded with two tickets to see Tyler Henry “The Hollywood Medium” at the Silver Creek Event Center at Four Winds Casino in New Buffalo, Michigan on Saturday, May 11, 2019, at 9 PM EDT, valued at $118. Winners will be first notified via the email address on their entry, followed up by a phone call to the phone number listed on their entry. Odds of winning will be determined by the total number of correct eligible entries. Once notified, the winner will have three (3) business days to claim their Prize. If a winner fails to claim their Prize, it will result in the forfeiture of the Prize and a new drawing may be held from the remaining eligible entries at the discretion of ‘WCIU, The U.’ Prize Winner must possess a valid picture ID to claim their Prize. PRIZE RESTRICTIONS & CONDITIONS. These Prizes are non-transferable and will be delivered no later than five (5) business days at the expense of Weigel Broadcasting Co. to the winner via UPS Ground with signature required. Winner is responsible for income and other taxes on the Prizes. Prizes are subject to terms and conditions of the Prize provider and Sweepstakes Parties. There will be no substitute or cash redemption awarded to any Sweepstakes winner. All income and other taxes are the responsibility of the winner. By entering, the winner is consenting to the use of their name, likeness, and/or biographical information for advertising and promotional purposes without additional consideration, including any in studio appearances. By participating in this Sweepstakes, all participants and prize winner agrees that Four Winds Casino, their partnerships, subsidiaries and affiliates and each of such entities’ respective officers, directors, agents and employees are not responsible or liable for any injury, loss, illness, litigation or damage that may occur from participation in the Sweepstakes or acceptance, possession, use or misuse of prize. In the event that any dispute arises regarding the meaning or interpretation of these official rules, participants agree that the dispute shall be resolved by applying the laws of Illinois and that it shall be resolved by and within the state or federal courts of that state. MISCELLANEOUS. The decisions made by ‘WCIU, The U,’ concerning any and all matters with respect to this promotion shall be final. In the event of a computer, telephone failure, or any other circumstances beyond the control of ‘WCIU, The U,’ where it becomes impracticable to award one or more prizes, ‘WCIU, The U,’ may, in its sole and absolute discretion, determine not to award any such Prize. This Sweepstakes is void where prohibited, penalized or otherwise restricted by law. A copy of these official Sweepstakes rules are available at the ‘WCIU, The U’ offices located at 26 N. Halsted, Chicago, IL or by writing to ‘WCIU, The U,’ ‘The Jam & Tyler Henry “The Hollywood Medium” – April ‘19, 26 N. Halsted, Chicago, IL 60661. Viewers can also find the official Sweepstakes rules at www.WCIU.com. If you wish to receive the name of Sweepstakes Prize Winner, you must send a self-addressed, stamped envelope to ‘The Jam & Tyler Henry “The Hollywood Medium” – April ‘19, 26 N. Halsted, Chicago, IL 60661. ‘WCIU, The U’ must receive any request for the Winners’ names no later than June 21, 2019.